Any growing organism – regardless of it being single- or multi-cellular – rests upon the reiteration the growth and division of existing cells under favorable conditions. During each round of this process, the cell cycles through an ordered series of events in which its genetic information is duplicated and then splits up into two cells. These events are tightly regulated and certain checkpoints must be passed in order for the cell cycle to be completed. The loss of control of these processes is a hallmark of cancer. The cell cycle is split up into four major phases based on the events unfolding in the cell. During the first gap phase (G1) the proteins are produced that are essential for DNA replication. The genetic information is then being replicated during the synthesis (S) phase. In the second gap phase (G2) all the components that are necessary for the separation of the duplicated DNA during the subsequent mitosis (M phase). Cells that are not actively dividing are considered to be in a quiescent state in the resting phase G0. Two checkpoints between G1/S and G2/M phase must be passed in order for the cell cycle to progress. Once replication, DNA replication must be finished. Therefore, the major checkpoint in the cell cycle is the restriction (R) point between G1 and S phases, prior to DNA duplication, at which the cycle progresses depending on mitogenic or inhibitory factors such as DNA damage and signals from various signaling pathways. A second checkpoint is at the intersection between G2 and M phases. 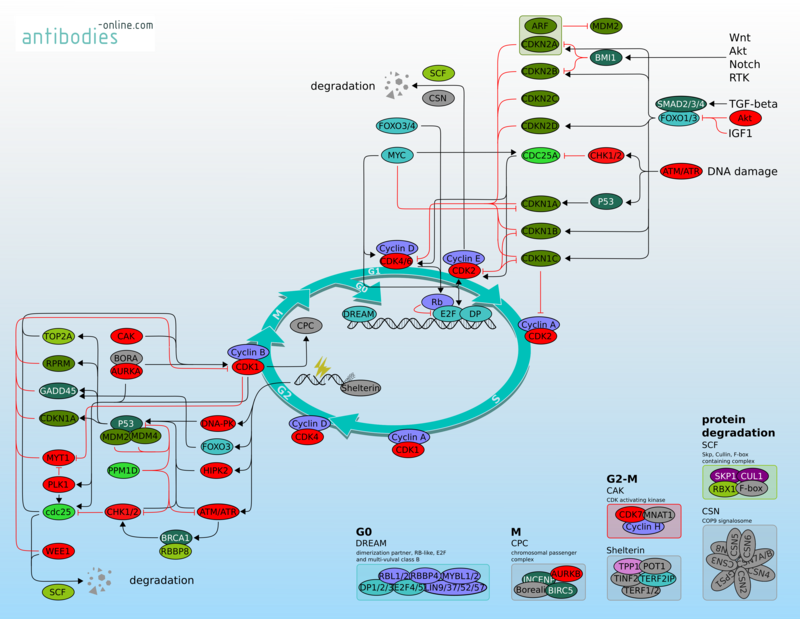 Progression from one phase to another is controlled by cyclin dependent kinases (CDK) and their activators, cyclins. 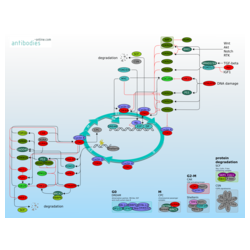 Latter proteins are unstable and their cellular concentration cycles throughout the cell cycle. Accordingly, specific cyclin-CDK complexes are characteristic for the different cell cycle phases. In addition, their activity is further modulated by CDK inhibitors. Collectively, these factors maintain balance on a cellular level and beyond.